As they say, a team that plays together, stays together. 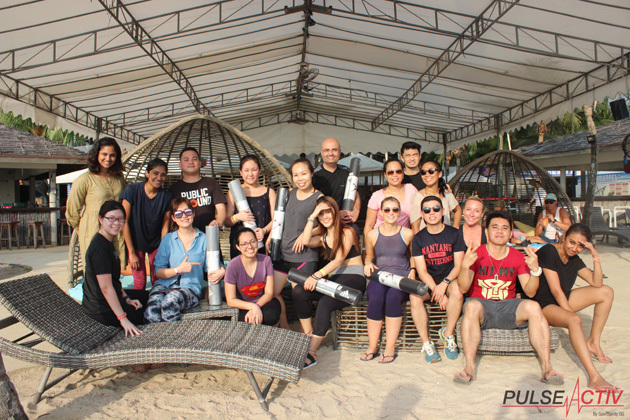 On 5 October, the Human Resources team of 20 staff gathered at Siloso Beach, Sentosa for a day of games and activities, organised by PulseActiv. 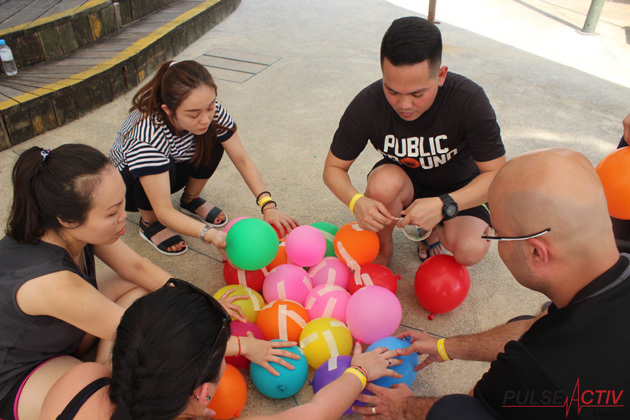 Among the array of team building activities (outdoor and indoor) PulseActiv offers, the team opted for the ‘Running Man’ challenge, inspired by the popular Korean variety game show of the same name. As safety is of utmost importance, the team was given a safety and event briefing before activities started. 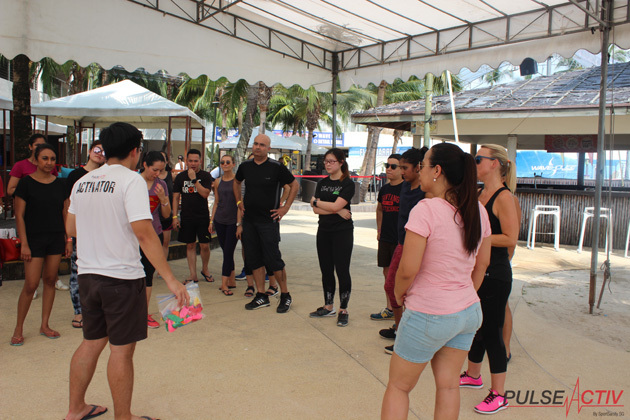 Before the main challenge, the friendly and professional facilitators at PulseActiv got us warmed up with a quick energiser game – Hunter, Squirrel and Earthquake. We first got into groups of three with two people joining hands to create an arch forming a ‘tree’ while a third crouched underneath it, becoming ‘squirrel’. “Hunter”: Where all ‘squirrels’ have to find a new ‘tree’. “Fire”: Where all ‘trees’ have to find a new ‘squirrel. After three rounds of commands, the last person standing did a forfeit dance with two selected team members, before we proceeded to the ‘Running Man’ challenge. 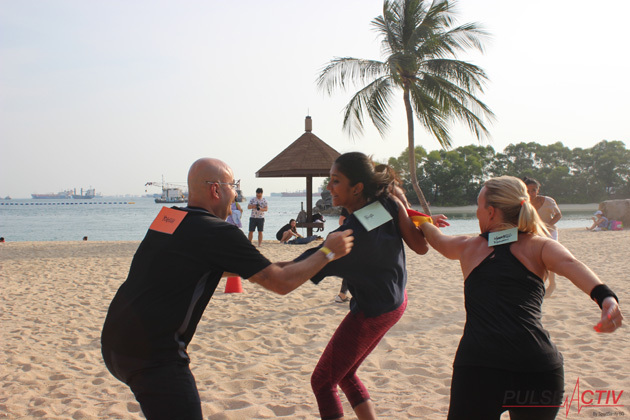 During the ‘Running Man’ challenge, we were divided into three teams where we showcased our competitive sides, going head on against each other in a series of seven missions – six games and one finale challenge. In the initial six games, teams had the chance to win various power-up cards which could be used in the finale challenge. The build a base challenge saw each team constructing a giant balloon bed strong enough to support the weight of three members of the team. With a limited time and number of balloons to work with, creativity and teamwork was essential to clinch victory. For this game, rubber ducks, big and small, were scattered on the ground. 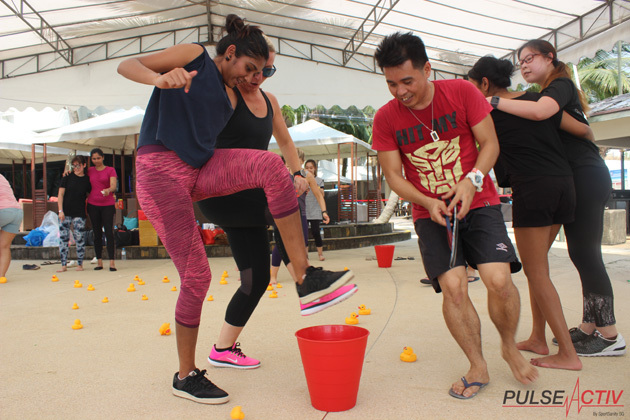 Each team split themselves into pairs with each pair having to pick up a small rubber duck and drop it into a bucket using only their ankles. The goal for all three teams was to collect 10 small ducks, but here’s the catch – there were less than 30 small ducks in total. In this mission, all members of the team had to lie on their backs and use their feet to support a bucket filled with water that was placed in the center. Once in position, each member took turns to remove their shoes, being careful not to tip the bucket over. Victory went to the first team to successfully remove all their shoes with the water in the bucket intact. 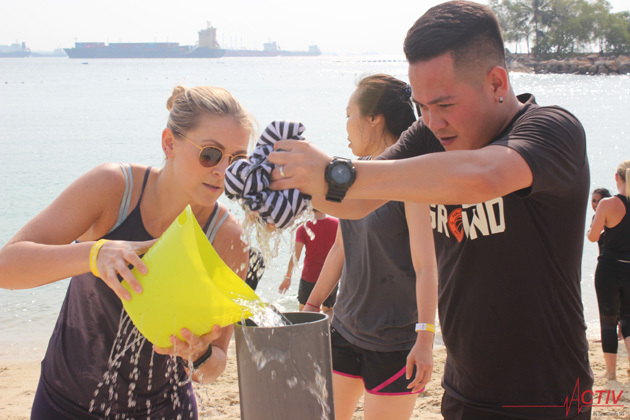 For this, the goal was to be the fastest to transport 10 water bags from one end to another by tossing and catching them with towels provided (in pairs), with the last member catching the water bags with a bucket. In holey pipes, teams worked together to fill a pipe with water to get a ping pong ball stuck at the bottom out. Each team was provided with a cup and a bucket to collect the water, but could also use whatever they had on them. 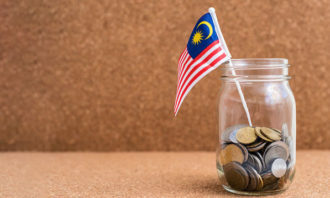 However, seeing the small size of the cup and the holes in the bucket, the competitive spirit in us saw shirts and hats being used to collect water to fill the pipe. This mission saw team members standing in a line each with a balloon tied to their back. In a formation of a train, the teams worked together to burst opponents’ balloons while protecting their own. Throughout each of the six small games, the winning teams were awarded power-ups (such as reflect, enlarge, and revive) to be used in this finale challenge which saw team members strategically eliminating the rest of the teams by ripping the name tags off the backs of each of all opposing team members. 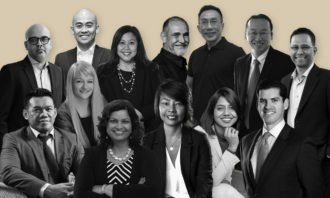 The last team with at least one member standing wins. 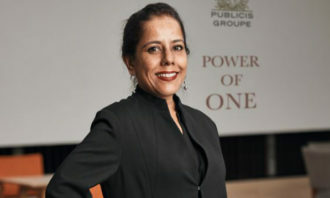 Though the team truly battled it out every inch of the way, the initiative has more importantly, inculcated the spirit of teamwork at Human Resources.